So have a fun with this...gizmo from parallel worlds! So good bye and see You at some other psychedelic project! That looks fantastic. The model & photography are first class. It’s got to be one of the ugliest aircraft ever made - absolutely hideous. I saw the real thing at Farnborough, it certainly didn’t set my pulse racing! But that is without doubt the ugliest aeroplane of all time. Needs to be displayed next to a Hunter or Spitfire! Good looking model ... Definitely not a pretty aircraft. Very nicely built & displayed model MRMLA!I love the extra touches of detail you put into it. A beautiful model. From a modelling point of view, I am kind of sad that it lost out to the F-35. It would have looked really cool on the flight decks of the Queen Elizabeth class carriers. Nice model of what is possibly the most repulsive aircraft ever built. Great model with an impressive array of interesting detail work! Lots of modelling skills on display, that's for sure! Very nice model of a beastly looking aircraft, congrats! A terrific looking model of an aeroplane which, if nothing else, is certainly eye-catching - even if for all the wrong reasons. A great finish and excellent photography. What was Boeing thinking though? I can't believe that huge intake would have been very stealthy. Perhaps they were trying to save Hasegawa the trouble of having to design one of their Eggplane kits. Ugly looking thing, reminds me of a basking shark, however you have made a good job of it. Good skills and cracking photos. Amazing. With a lot of extra détails. Love this plane. Thank You chaps so much to sharing Yours nice comments! FAAMAN's question was already answered above, but concerning of new double release - it's new boxing but old forms with all theirs incorrectnesses of both kits. And finally - You are true Meatbox8, intake shape was one of reasons why this project lost. Thanks once more to All! There are no ugly airplanes--some just have more character than others. This one is blessed with an amazing amount of character! My guess is that owing to a significant deficiency of hover thrust compared to weight (pictures of it hovering indicate that as many parts that could be removed, e.g. the inlet, were removed), it didn’t get very many coats of paint beyond one, if any. Since much of the exterior consisted of black composite fiber/epoxy panels, that made for a motley finish. 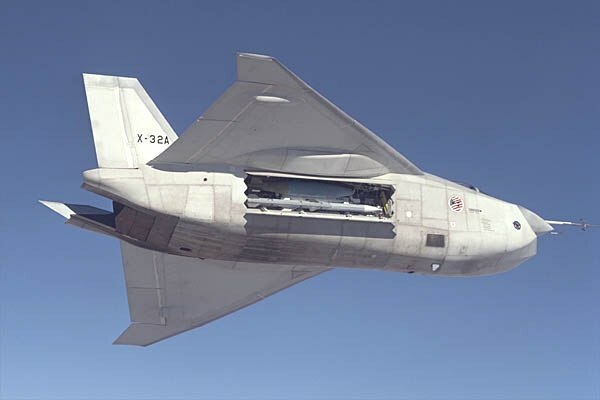 With respect to its competitiveness vis-a-vis the X-35, the latter could hover in its full up and away configuration, at Edwards AFB no less (2,500 feet above sea level and usually hotter than the standard day). Hi MRMLA, that's an excellent model! It's nice to see this model getting some attention! I see you replaced the horrible kit fins with new ones, bravo! And you even opened the vortes flaps, one of the very unique features of the design.